It’s an easy 2.5hr flight from Rome to London. Just make sure you get to the airport early enough to go through passport control. Yes, even though the UK is (supposedly) part of the EU, unlike the no passport control to other EU countries, the UK still imposes this obligation. 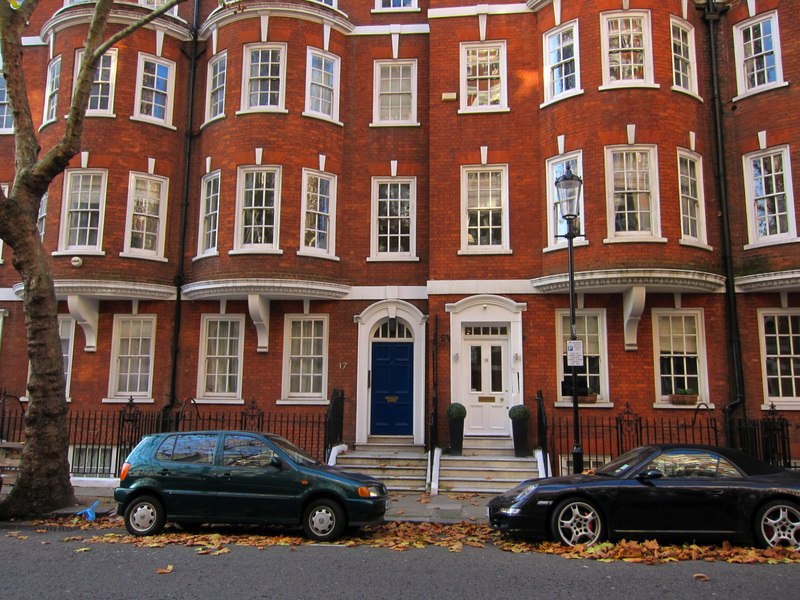 We rented a 1 bedroom apartment on the top floor of a red brick Victorian building on Draycott Avenue near Sloane Square, which is near Chelsea and South Kensington. It’s a bit removed from the hub and clatter of the West End and Leicester Square but it’s a short hop on the Tube to anywhere we’d like to go. We found this place through an apartment rental called London Connections. They are an American based company with over 40 really nice rentals in London. 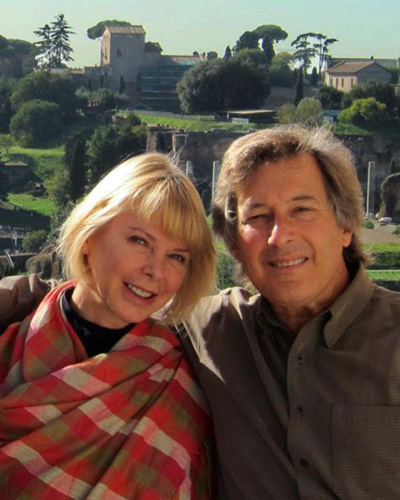 The owner of London Connections, Thomas Moore Sr. is an American from Utah and an avid anglophile. He keeps a blog about the UK that is pretty amazing. The best way to navigate the underground is with the Oyster card. Normally all “Tube” fares in the central London (zone 1) are 4£ per trip. With the Oyster card it’s 1.90£ during off peak (9:30a-4:00p and again after 7:00p) or 2.40£ for peak hours. In the 6 days we were there we never travelled during peak hours. We even used the tube to travel from South Kensington station to Heathrow airport for 2.40£ per person. We once took this trip by cab and it ended up costing 100£. The Oyster card can be purchased at train stations all over the city and airports. We flew into London Gatwick from Rome and bought our cards at the Gatwick express train station. The initial payment is 3£ for the card and 15£ for the initial charge, which is good for 5 trips in zone 1. After that you swipe your card by an oyster card reader and than “top off” the amount. The minimum at a manned window is 5£ but if you use a machine you can top off as little as 1£. My birthday is November 11th, Armistice Day. As a kid it was a big holiday. We used to get the day off from school and American flags were displayed proudly from flagpoles or draped across the faces of the neighborhood houses. 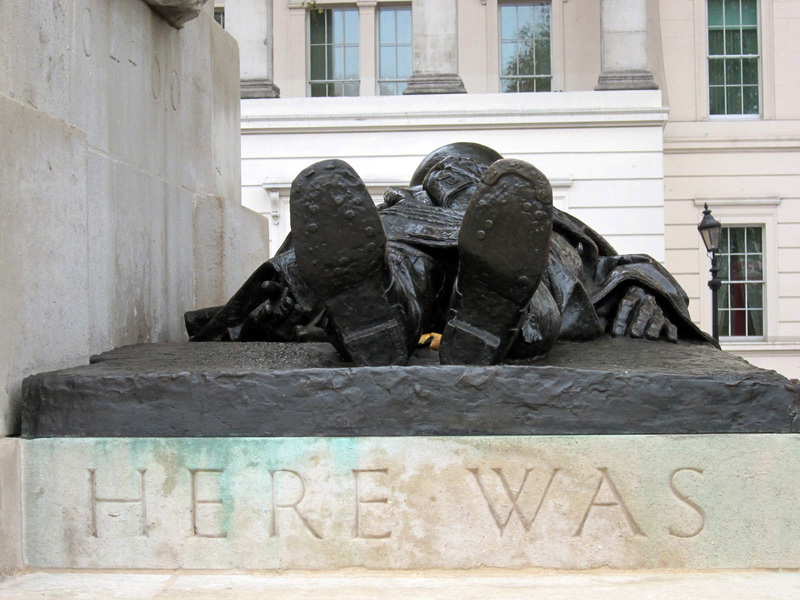 Armistice Day was a memorial to the fallen of World War I. The war ended on the 11th hour of the eleventh day of the 11th month of 1918. As I got older, and most of the WWI vets died off, the holiday was changed to Veterans Day. It also kind of lost its importance. After all, we also had Memorial Day in May and the Memorial Day Parades of the late Spring seemed to be more popular than the Armistice Day remembrance. Memorial Day goes back to the Civil War. It’s totally American and has grown to represent all people who served in all wars. It’s also augmented by the festivities of Memorial Day Weekend and the Indianapolis 500 car race. Armistice day just couldn’t compete. In the UK, however, November 11th is still revered as the holiday to honor those who have fallen while fighting for their country. In the UK its called Remembrance Day. It’s a somber day of recollection to those fallen in the service to their country. Everyone is encouraged to wear poppies on their lapels and (plastic) poppy sales are ubiquitous, at almost every street corner. The poppies relate to the WWI poem “On Flanders Field” by Joyce Kilmer. As a kid we used to have poppies (real and paper) given our on Armistice Day. I haven’t seen one in the US in years. There was a small memorial on November 11th at the Constitution Arch, also known as Wellington Arch. There are a couple of very moving memorials here honoring the fallen soldiers of the ANZAC forces (Australia and New Zealand). There was also a memorial recital at the royal Albert Hall that night. But the main “Remembrance” occurred on the following Sunday when the Queen, the Royal family, the Prime Minister, past Prime Ministers and leaders of all political parties laid wreaths on the Cenotaph memorial in Whitehall, the official war memorial of the UK. At 11:00, a two minute silence is observed through the country. In London, the observation is followed by the Horse Guard parade and the Royal Marine band. In 1939, the two minutes of silence was moved to the nearest Sunday so it wouldn’t interfere with the wartime production when the Remembrance fell on a workday week day. The 1919 Cenotaph in London was originally built to commemorate the dead of World War I but it now serves as the memorial cornerstone of all the “Glorious Dead”. It is a highly regarded memorial with the highest reverence, which is why Charlie Gilmour (son of Pink Floyd guitarist David Gilmour) was given a 16 month sentence in jail for hanging from one of its union flags while intoxicated with LSD, valium and booze. He was part of student protest on higher University fees. Gilmour was released after only serving 4 months. 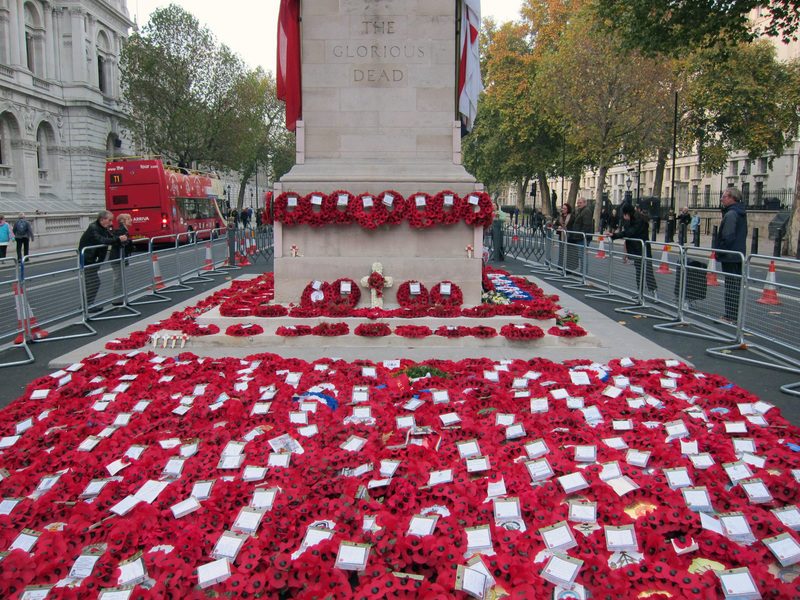 The memorial wreaths and sea of poppies laid at the base of Cenotaph are very moving. The war memorials even extend to installations of a miniature graveyards of crosses throughout the grounds of the Westminster Abbey. 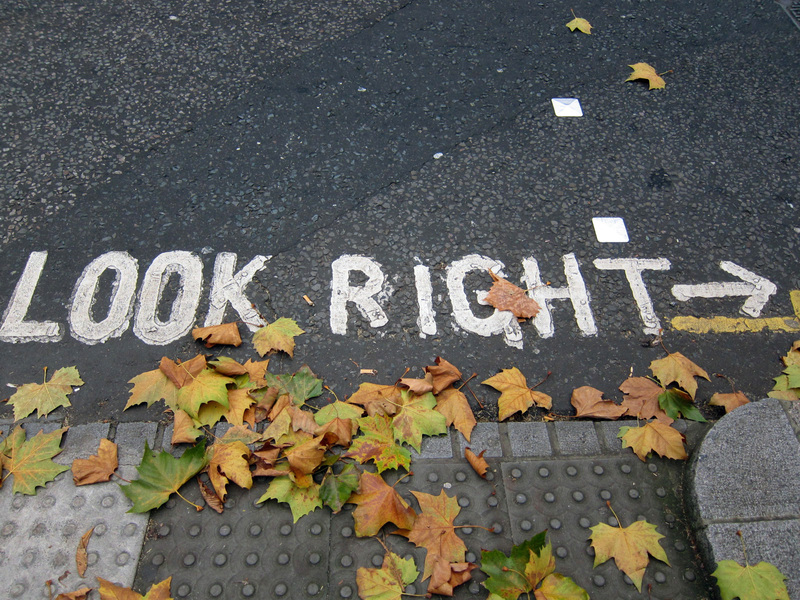 On Saturday, November 12th we took a long walk to Portobello Road, home of the larges antique market in London. It’s very reminiscent of the Marché aux Puces in Paris only prettier. The Portobello market goes on for a couple of miles, starting with antiques and moving on to clothing and food. Saturday is the big day for the antique fair and the street is filled with display tables and, of course, thousands of people. Portobello market began as a fresh-food market in the 19th century. The antique dealers came later on in the 1950s. 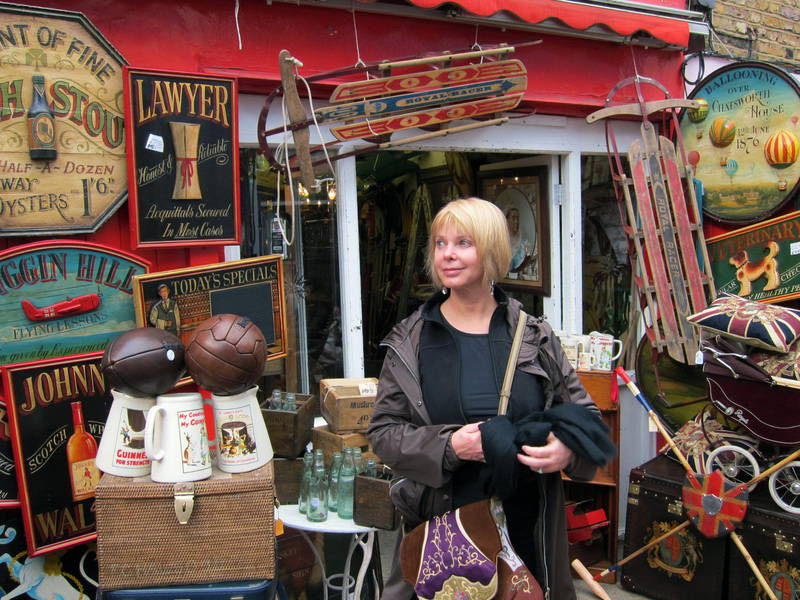 It’s a mixture of real antiques, bric-a-brac and reproductions, but it’s all a lot of fun. As if the market wasn’t popular enough, a few years back the movie “Notting Hill” featuring Hugh Grant and Julia Roberts, used it as a backdrop for their romantic comedy. The movie did OK. The Portobello Market did better. Six days in any city should be enough to see the major sites and catch the flavor of any city, but we’ve been in a mode of relaxing and not rushing off to every museum or every attraction. We’ve been here a few times so we had our short list of places to return; the National Gallery, The V&A Museum, the British Museum, the Portrait Gallery, The Soane’s House, a couple of plays in the West End, a movie or two, a lot of pub food, a couple of trendy meals, some shopping and walking till our feet barked. We never made it to the Portrait Gallery. We just ran out of time. On Sunday we walked over to the V&A Museum, the design museum of London and one of the best collections in the city. The V&A was opened in 1852 and now boasts over 4 million objects covering over 5000 years of history and design all the way up to modern ideas. 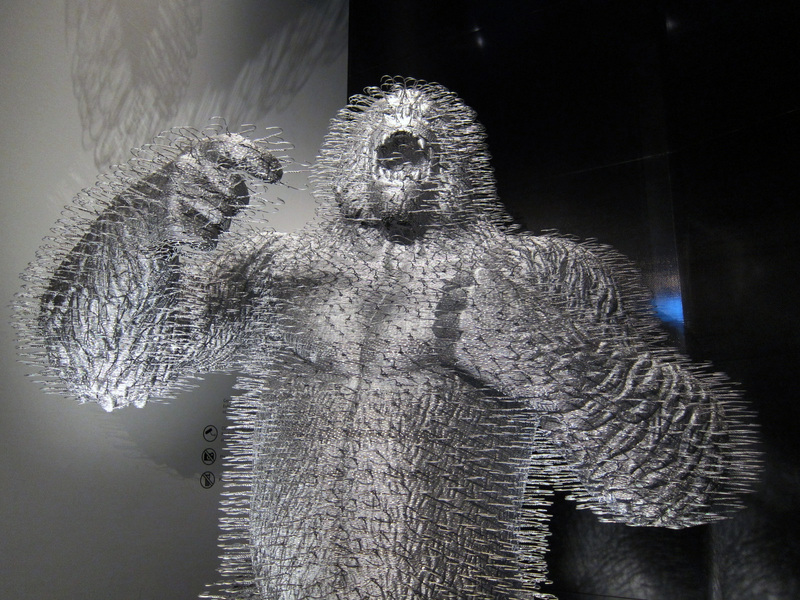 There was an amazing coat hanger Giant Gorilla by Scottish artist David Mach at the entrance to a modern design room. The Museum was created to hold many of the inventions of “The Great Exhibition” of 1851, the first World’s Fair. The building alone is an architectural masterpiece. The medieval collections are fascinating and the curators are trying to excite a younger audience these days with glass cases of “Guess What They are” objects; drinking games, odd clothing, cooking utensils, etc. We were wrong on most of them. The Cast hall includes; replicas of the sarcophagi of Richard the Lionhearted, Eleanor of Aquitaine and Henry II, the main portal entry to the Cathedral of Santiago de Compostela and a complete cast of Trajan’s Column cut in half to fit inside the hall. That’s only a few of them. The museum has glass, inlaid metal, furniture, paintings, prints, sculptures, clothing, weapons, complete salons from 17th, 18th and 19th century English homes and even the Great bed of Ware, the largest known bed of the 16th century. We stayed for about 3hrs and still never got through half of it. After 4hr of the V&A we walked down the street to London Pub for a pub lunch, one of our favorite experiences in the UK. We ate a lot of Pub food in London, bangers and mash, fish and chips, steak and ale pie, chicken and mushroom pie, hunter’s chicken pie, shepherd’s lamb pie, mash, carrots and cold beer. 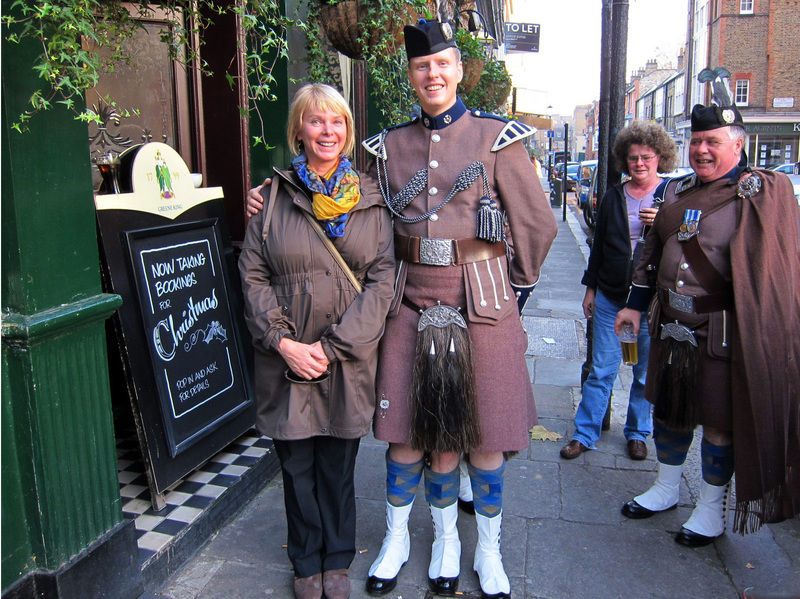 We dined with a group of wacky Scots at the the “Bunch of Grapes” near the V&A in South Kensington. We ate at the “Chandos” in Leicester Square, The “Duke of Wellington” on Portobello road, the “Pig’s Ear” in Chelsea/South Kensington, and the “Prince of Wales” on Drury lane, close to the ground zero location of the 1563 plague where close to 25% of London’s population died. Londoners have a well deserved and historic fear of disasters like fire and animal disease. The memories of the mad cow disease in the mid 1990s and 2001 foot and mouth disease that destroyed over 10 million cattle and sheep are still very much on the minds and bellies of the Brits and the standard of food preparation in UK Pubs is very strict. We ordered a hamburger at one pub and asked for it medium rare, only to be told that according to code, beef needs to be thoroughly cooked. We understood and then questioned ourselves why we even ordering a hamburger. However, overcooked burgers aside, the Pub lunch is still one of our favorite treats in London. You pay at the bar and a few minutes later they bring the meal to your table. You eat, you leave. It’s all easy and delicious. The ambience is old world, the crowd is always entertaining and the price is fair. Pub food used to be the “cheap eats” of London but with the introduction of American Style fast food the Pub meal has been raised to “Traditional British Cuisine”. The new British cuisine of Gordon Ramsey and Jamie Oliver has also spawned the GastroPub and there are lots of them dotting the small streets of London. If it’s named GastroPub you’ll probably pay a lot more than just an olde neighborhood eatery. 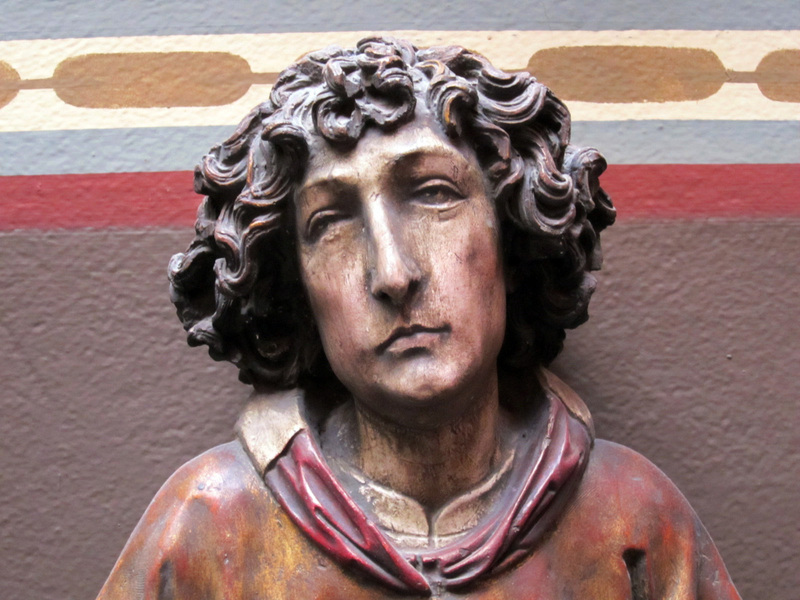 Of the many museums in London, one of the strangest is the Soane’s Museum. Sir John Soane was born in 1753, the son of a bricklayer, and died after a long and distinguished career, in 1837. As an architect, his main achievement might have been the Bank of England but it is the small red British telephone booth that has endeared him to the world. The phone booth’s design was taken from Soane’s tomb in the churchyard of the St Pancras Church. 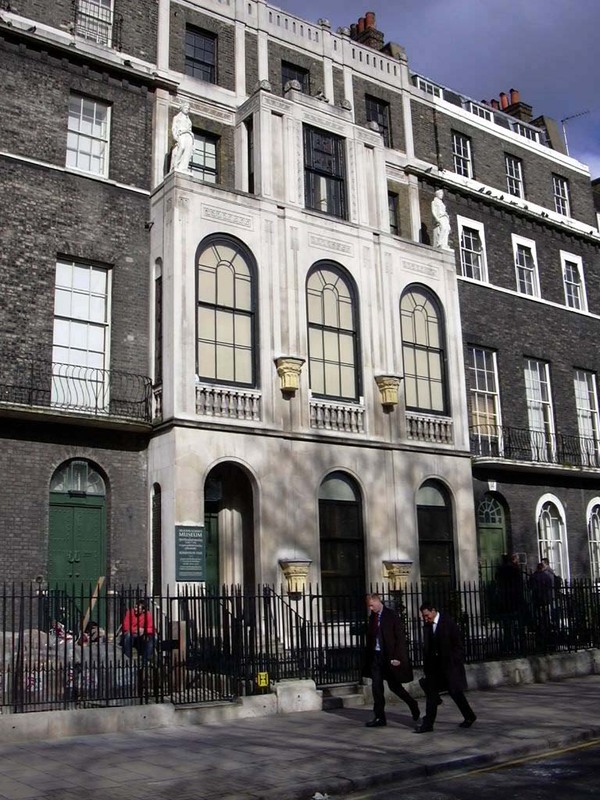 Soane demolished three houses on Lincoln’s Inn Fields and built three new ones, all connected inside into a grand home and museum. As well as being an architect, he was a devotee of ancient artifacts and somehow was able to get his hands on an amazing collection of Greek, Roman, Egyptian and European treasures. The highlight is the 1300 BC Egyptian sarcophagus of Seti I, the father of Ramses II, the most popular Pharaoh in history or at least the most widely popularized. After Soane acquired it and installed it into his “Sepulchral Chamber” chamber below ground level, he threw a party that lasted three nights. Supposedly over 1000 people showed up. The painting rooms include 15 of the Piranesi’s original 18th century sketches of ancient Paestum and two very funny 18th century satiric series of paintings by William Hogarth; “the Election” and “the Rake’s Progress”. After the death of his wife in 1815, he lived here alone with his dog Fanny, who is buried in a fantastic Tomb in the courtyard of the house. He also became estranged from his sons after the death of his wife and ended up giving the houses and the collection to the state. It’s pretty much in the same shape as when he died in 1837. We used to love walking around Covent Garden. It started out as a small open-air fruit and vegetable market and by 1654 but by the early 18th century it became part of a very tough neighborhood; tenement homes, poor people, prostitutes and lepers. A little north of here was the site of the famous Beer flood of Oct 17 1814 when the beer vats of the Meux Brewery on Tottenham Court Road blew 323,000 imperial gallons across the neighborhood. Basements were flooded, eight people drowned in beer. The brewery was taken to court but the case was thrown out and declared an act of god. Today the Dominion theatre sits on the site of the old brewery. In the 1830, as part of an urban renewal project, the covered market (still in use today) was built. For 130 years it became a fashionable place to buy produce, but by the late 1960s the area got too congested with traffic and the market was moved. In the 1980s the old covered market reopened with arts and crafts shops, pubs and cafes. We first strolled into it in 1995 and it was as charming as could be. It’s changed considerably. The small craft shops have been replaced with an Apple Store, Marks & Spencer, the North Face, Urban Outfitters, Betsy Johnson, the Body Shop, Carhartt, Levi’s, Dockers and Diesel clothing, Foot Locket, H&M, L’Occitane, and lots of other international brands. Yes, there are still a few small craft shops, but I don’t give them long. We didn’t just eat pub food the entire visit to London. We treated ourselves to lunch at the Atelier Joel Robuchon. This 2 Michelin star mixture of sushi/tapas bar has brought chef Joel Robuchon acclaim all over the world. He has Ateliers in Paris, London, New York, Tokyo, Taipei, Hong Kong, Singapore, Las Vegas. The lunch menu is a great deal; two plates for 25£ (starter and main) or three plates (starter, main and dessert) for 28£ ($45). For 8£ more you can add the wine pairing. It was pretty spectacular and one of the best prices for a 2star Michelin lunch anywhere. We did see a couple of plays in the West End. Half price tickets are pretty easy to get through many websites or through TKTS on the day of the show. The highlight was Mark Rylance in his Tony winning award role of Rooster John Byron in “Jerusalem”. Go see this play, or go see anything with Mark Rylance.